first, HALLELUJAH this thing is live!!! This is pitcher 29. Sadly, it cracked, so I think I'll hang it outside and fill it with succulents. It's a simple stoneware form, pretty straight sided, and I cut down the base to form the spout. I was moseying around on pinterest one day and saw a beautiful self portrait by Frida Kahlo that was full of flowers- I borrowed these flowers from her. The sugar bowl is one I made to fit this vintage pressed glass top I found in a thrift store box when my sister in law was moving. I liked its shape and wondered if I could make a bottom to fit it. It *almost* fits perfectly. I might go after the base with a sanding tool to make it more secure. Our sugar bowl has seen better days and I'd like to keep it from breaking entirely (it is part of my wedding McCarty pottery stash). Pitchers 30, 31, 32, and 33 are waiting for their bisque fire. And almost every time I unload a kiln full of porcelain I consider switching to it entirely. I LOVE the stuff. Love love love. I have gotten to the point where I can throw tall forms (thank you, pitcher project!) and I understand what it requires of me in terms of handbuilding (dry very very slowly), but plates are still scary. It is less forgiving, more demanding, but, oh. goodness. This little teacup was a test piece that I'd applied another layer of decoration to, hated, and scraped off. The rim bears evidence of the scraping, but I love it anyway. So far from perfect but still lovely and useful. And maybe better because of its scrappiness. 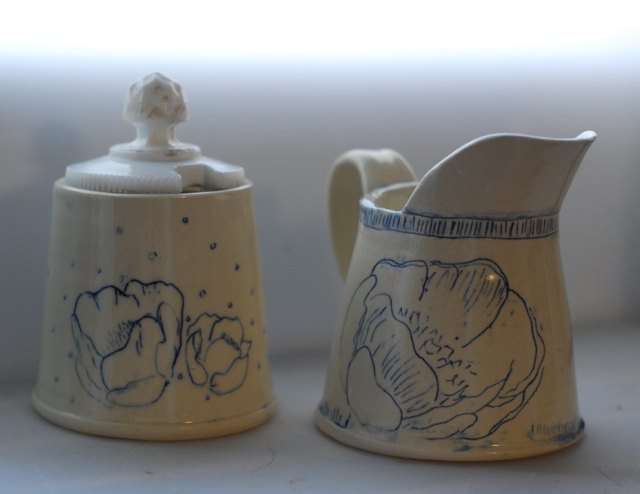 So that may be my 2014 goal- switching to porcelain. Sometime this fall, I'll add pieces from this modern blue and white line and the speckled egg line to a storefront here, but until then, I'm keeping my etsy shop (available up top under the shop tab) open and available.